A Good Man is Hard to Find is a wonderful entry point to the greatest American short story writer. I have never forgotten my reaction in finishing the first story in this collection. The bottom fell out and my world was forever altered. Innocence, tragedy, humor, grotesquery, religious longing, it is all there is spades. After reading these you will be ready for the Complete Stories. In 1955, with this short story collection, Flannery O'Connor firmly laid claim to her place as one of the most original and provocative writers of her generation. Steeped in a Southern Gothic tradition that would become synonymous with her name, these stories show O'Connor's unique, grotesque view of life-- infused with religious symbolism, haunted by apocalyptic possibility, sustained by the tragic comedy of human behavior, confronted by the necessity of salvation. 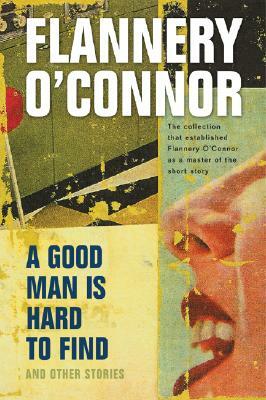 With these classic stories-- including "The Life You Save May Be Your Own," "Good Country People," "The Displaced Person," and seven other acclaimed tales-- O'Connor earned a permanent place in the hearts of American readers. Flannery O'Connor (1925-1964) was born in Savannah, Georgia. She earned her M.F.A. at the University of Iowa, but lived most of her life in the South, where she became an anomaly among post-World War II authors-- a Roman Catholic woman whose stated purpose was to reveal the mystery of God's grace in everyday life. Her work-- novels, short stories, letters, and criticism-- received a number of awards, including the National Book Award. FLANNERY O’CONNOR (1925–1964) was born in Savannah, Georgia. She earned her MFA at the University of Iowa, but lived most of her life in the South, where she became an anomaly among post–World War II authors: a Roman Catholic woman whose stated purpose was to reveal the mystery of God’s grace in everyday life. Her work—novels, short stories, letters, and criticism—received a number of awards, including the National Book Award.